Meal planning is one of those things that has become increasingly important to me in the past year. I started meal planning right after my daughter was born because let's be honest I had enough things to think about besides dinner. I had tried to meal plan a few times in the past few years but for some reason or another could never stick with it. After a year and a half of trial and error, I finally found a formula that works for me and my family that I'm excited to share! 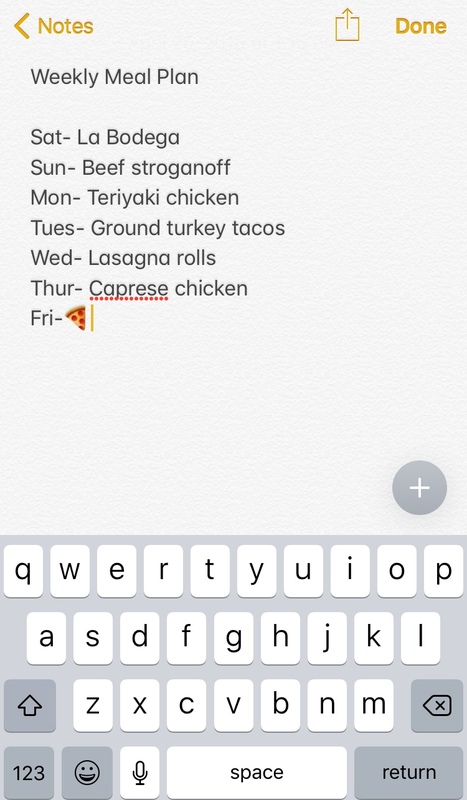 I know a lot of people who like to write their meal plans on paper. Not to knock them but I have a million reasons why paper doesn't work for me. Not to mention that I have a toddler who loves to shred paper (why is that so fun?). I always have my iPhone with me so I just use the Notes app. 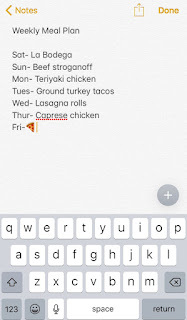 I list every day of the week (starting with Saturday because that's the day I shop) and then type my grocery list underneath it so it's all in one place. Now, I realize that equals 8 and its because they can overlap. For instance, every week we have "Taco Tuesday" but its not literally tacos every single week. That would get really old really fast. It's pretty much just a Mexican night. It can be ground turkey tacos, chicken quesadillas, beef enchiladas or the Chicken Tostada recipe that I shared with you last week in my Friday Favorites post. Pizza night really is pizza night every week because no one gets tired of pizza. Ever. Anyways, by having a standard formula it helps me pick out what we're going to be eating that week. I like to have a pasta night in there because it allows for flexibility if something comes up. Pasta doesn't really go bad so I can always bump it off the menu if I need to. Keep a list somewhere of things you've tried and liked. For me, I do this on Pinterest. Pinterest recently added sections to boards so my Lunch and Dinner board is broken down by how I meal plan. If I have a chicken night to fill and I can't think of what to make I hop on Pinterest and look at not only at new recipes but at the recipes that we've tried and liked. If I find a recipe on Google and get a good reaction from the family I'll make sure to pin it to my boards so that I can remember it for the future. If you're someone who likes to eat out once a week then plan for it. 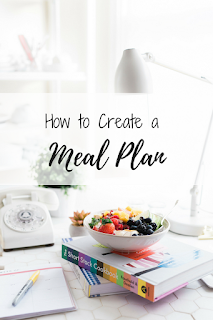 Don't try to plan a meal for every single night of the week because you're likely to waste food and stop meal planning. If I know that we're going to have a busy night and might want to pick up some takeout then I just leave that day blank. Simple enough. I'm not talking about planning all of your meals for a month because that's just crazy. Sometimes when I'm meal planning I think "ooh that sounds good!" but it doesn't always work for the week I'm planning for. So, under my grocery list I'll type out a section for "Next Week Ideas". Do I always use my own suggestions? No, not always but it helps me have a few ideas so I'm not starting from scratch every week. A question that I get asked a lot is if I make "special" dinners for my daughter. The answer is absolutely not. She eats the same meals that my husband and I eat. Sometimes we have to modify slightly but not so much that I'm cooking her her own dinners. For example, if we're eating tacos, she might get a cheese quesadilla and some taco meat because she's not old enough to understand how to hold a taco. Another example is if we have burgers, we'll give her a deconstructed version by cutting up the bread, meat and cheese for her. It's very important to us that our daughter feels like she is a part of our meal times and is eating the same things we are. It encourages her to try new foods and has become one of our favorite family pastimes. 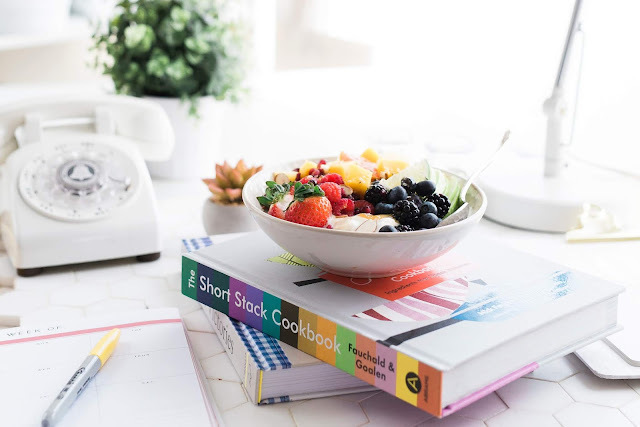 What meal planning strategies work for you? I'd love to hear! Hi, I'm Mandy! I'm a thirty something mama living in Kansas City. I share my thoughts on motherhood, family budgeting, and, how to be the best mom that I can be. This site may contain affiliate links, which means I may receive a small commission if you click a link and purchase something. I only post products that I have used myself and would never recommend something that I have not tried. The small profit that I make goes right back into supporting this blog. Thanks for your support!